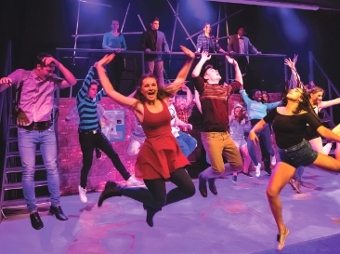 STUDENTS at Woking College reworked the 1980s classic musical Fame – home of leg warmers and leotards – to include urban themes for their latest production. Set in New York, the musical follows a group of multi-ethnic, multi-cultural students on their quest to achieve fame and recognition as they graduate from their Performing Arts courses. Everyone will remember the anthems Fame and Work Hard, which inspired the students to go on to greater things, and they both featured in the production. With a cast of over 30 and a live band of 20, the show was a fusion of young talent and brilliant directorship by Head of Performing Arts, Claire Nevers.